Cisco announced a new data center architecture that extends its Application Centric Infrastructure (ACI) framework into public data and its HyperFlex hyperconverged servers into branch offices. The idea is "ACI Anywhere" and "HyperFlex Anywhere." The expansion of ACI into the cloud with Amazon Web Services (AWS) and Microsoft Azure environments. ACI is Cisco’s intent-based networking solution for the data center. It integrates with all hypervisors and container frameworks on which applications are deployed. With ACI Anywhere, that journey extends ACI to any workload, any location, any cloud. Virtual ACI already supports bare-metal clouds and remote edge locations. And now with the new Cloud ACI capabilities, Cisco extends automation, management, and security to AWS and Microsoft Azure by fully integrating with their Infrastructure as a Service (IaaS) environments. This will be available in Q2. The extension of HyperFlex into branch offices and remote locations to power applications at the edge. Cisco said this allows customers to seamlessly extend computing and storage from their core data centers to the edges of their operations. This will be available in Q2. Enhancements to CloudCenter to help customers manage the lifecycle of applications across multiple cloud environments. The new CloudCenter Suite now features full application lifecycle management, greater workflow automation, and significantly enhanced cost optimization and governance. A simpler way for customers to buy and manage the technology across the entire data center architecture, via a single Enterprise Agreement. New Catalyst industrial switches and industrial Integrated Services routers purpose-built for IoT environments. Both run Cisco's IOS XE operating system and are managed by Cisco DNA Center, which gives customers a single pane of glass view across their campus, branch and IoT environments. Both are now commercially available. A new IoT Developer Center with learning materials, developer tools and support resources. IoT partner training and specialization programs. Cisco IoT certified partners gain the highest visibility across our sales teams and customers as trusted advisors across all IoT projects. 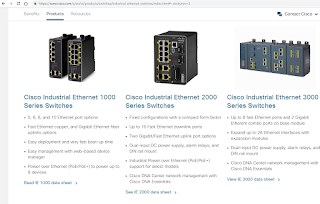 Cisco also has a rich ecosystem of industry partners, ISVs, machine builders and service providers to deliver IoT projects for customers in manufacturing, transportation, energy, retail, public sector and more. “We closely collaborated with Cisco on Cisco's new compact, low-power industrial router to meet the stringent environmental and safety standards used in the utilities industry,” said Didier Hinguant, telecom director, Enedis. “We operate and deploy our connected grid with thousands of Cisco routers via Field Network Director zero touch provisioning, with an agile, highly secure and future proof network using IPv6 to address our scalability constraints." 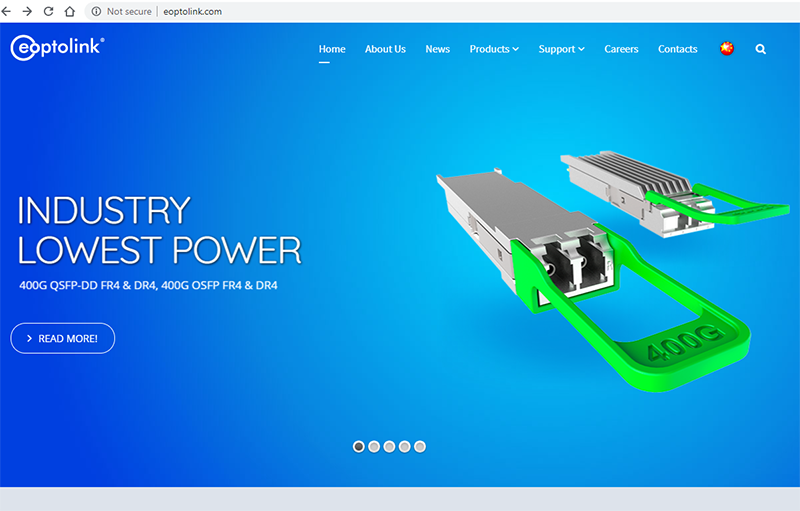 Eoptolink Technology announced sampling of the first sub-10W 400G QSFP-DD and OSFP DR4 and FR4 optical transceiver products. The new optical transceivers are enabled by Broadcom’s latest 7nm 400G 8:4 gearbox PHY device, the BCM87400. Eoptolink said its new transceivers feature a typical power consumption of 8W in compact form factors. This enables higher switch density and better system-level thermal performance, allowing network operators to cost-effectively transition to 400G Ethernet. 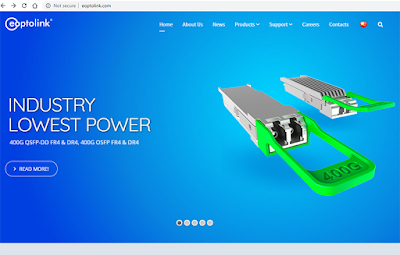 Eoptolink's QSFP-DD's (EOLD-134HG-5H-M DR4 and EOLD-164HG-02 FR4) and OSFPs (EOLO-134HG-5H-M DR4 and EOLO-164HG-02FR4), enable simpler and cost-effective designs for equipment vendors and lower OPEX costs for network operators. The DR4 and FR4 modules are fully MSA compliant and the full functionality of the gearbox and transceiver has been tested and verified together in 400G switches using the Broadcom Tomahawk 3 chipset with error-free operation and full interoperability. The DR4 modules support break-out applications with independent channel function for 4x100GbE enabling shuffle and aggregation applications using DR links. Eoptolink has also demonstrated 10km transmission distance that provides additional margin to the required 2km distance for FR4 transmission, showing a smooth way forward to support 400G LR4 applications when the standard is finalized. “With the general availability of 12.8-Tb/s switches such as Broadcom’s Tomahawk 3, hyper-scale data center operators and cloud providers will be leveraging the 400GbE ports in these switches to address increasing demand for higher bandwidth. Our low power 7nm Centenario PAM-4 DSP is essential to support high density 400G connectivity using QSFP-DD and OSFP optical modules, accelerating the adoption of 400GbE network infrastructure. With Eoptolink sampling the first optical modules based on Centenario, hyperscale and cloud network providers can deploy high density 400G switches with the lowest power optics available delivering uncompromised performance,” said Lorenzo Longo, senior vice president and general manager of the Physical Layer Products Division at Broadcom. “At Eoptolink, we are constantly improving the transmission performance of our modules to help our end customers. Broadcom’s 7nm DSP enables us to provide optical modules with the industry’s best performance at the lowest power. During 2018 the 400G ecosystem has been maturing and now all the sub-components for the transceivers are available in mass production. We are delighted to be the first transceiver manufacturer to offer these low power QSFP-DD and OSFP modules in high volume production thereby accelerating 400G adoption,” said Richard Huang, CEO at Eoptolink. Orange has acquired SecureData Group, a UK-based cybersecurity service provider, for an undisclosed amount. 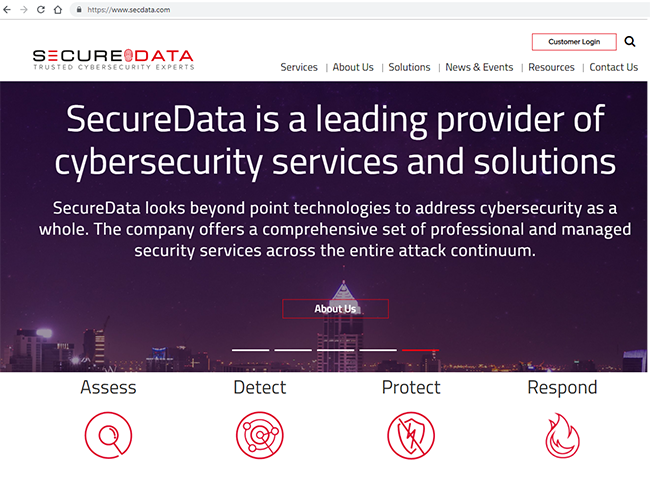 SecureData, has over 200 employees in the UK and South Africa, a cybersecurity consultancy with a 25-year track record. The company recorded annual revenues of circa 50 million euros in 2018 and has enjoyed consistent growth rates of approx. 20% since 2016. Orange said SecureData will help reinforce its strategic position in cyberdefense by bringing a new source of expertise and innovative technology. SecureData also boasts an advanced cyber-SOC (Security Operations Center) in the UK that will reinforce Orange Cyberdefense’s international reach by building upon the existing network of nine cyber-SOCs dedicated to monitoring and responding to security breaches on behalf of its customers. “We are very proud and happy to announce the acquisition of SecureData, which will mark a major milestone in Orange’s development in Europe’s cybersecurity market. 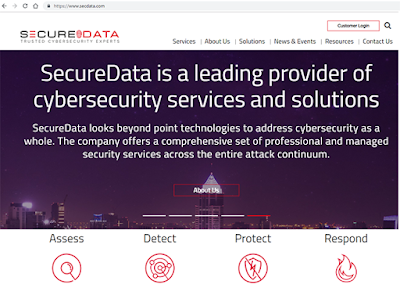 SecureData, just like Orange Cyberdefense, has successfully made the transition toward Managed Security Services, and shares the same passion for Cyber. We will progressively co-build together the operational and commercial synergies, with the patronage and experience of Michel Van Den Berghe, CEO of Orange Cyberdefense. Cybersecurity has become a critical element for both large and small companies as they evolve in an increasing digital-reliant world. We are convinced that the combined expertise of Orange Cyberdefense and SecureData will provide a powerful resource for our customers in ensuring the protection of their valuable data.” said Hugues Foulon, Executive Director of Strategy and Cybersecurity activities at Orange. Ian Brown, Executive Chairman at SecureData commented “We are both thrilled and excited to be joining the Orange Cyberdefense family. Both organisations share the same vision and aspiration for the cybersecurity market, and have many complementary services and skills. By being part of Orange we will be able to better serve the international needs of many of our existing customers as well as providing enhanced cyber services to Orange customers with the UK”. CyrusOne has activated IBM Cloud Direct Link within its data center in Carrollton, Texas. The service is further available to customers in the U.S. via CyrusOne’s National IX. Japan's KDDI is deploying Nokia's G.fast solution to apartments and multi-dwelling units (MDU) buildings to power its "au Hikari MDU Type G" service. Nokia said its solution will enable KDDI to use existing copper lines in MDU buildings to deliver 830 Mbps combined uplink and downlink speeds to customers. Nokia's G.fast solution supports Japan's VDSL2 specifications, which will minimize the impact to existing VDSL systems and enable operators to quickly upgrade their high-speed internet service to gigabit-class through a CPE replacement. Shigenari Saito, Administrative Officer, General Manager, Network Technology Development Division, Technology Sector, at KDDI said: "KDDI already provides 10Gbps service for our 'au Hikari' FTTH customers, but the speed we can provide has been limited to 100Mbps service for MDUs where fiber is difficult to deploy. Nokia's G.fast solution enables us to connect existing 100Mbps users and new G.fast users under the same DPU (distribution point unit). This gives us the flexibility and economical path to meet the customer's demands for higher speed. 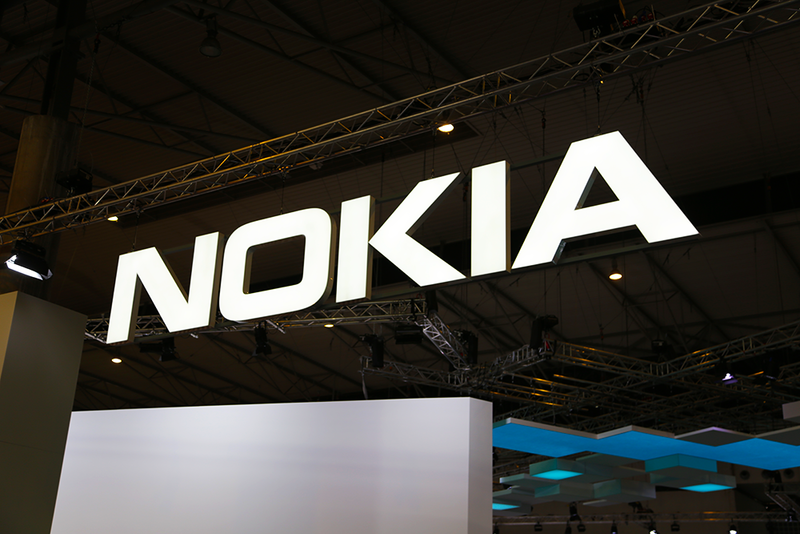 Our decision to deploy Nokia G.fast is based on our long-term relationship, Nokia continues to be our long-term partner for delivering technology innovations." Digital Realty announced a virtual power purchase agreement on behalf of Facebook, a client at some of its data centers. Specifically, Digital Realty has executed a long-term renewable power purchase contract with SunEnergy to secure approximately 80 megawatts of solar power capacity for Facebook. The solar project will be located within Virginia Electric and Power Company territory in North Carolina. All renewable energy certificates and environmental claims will be delivered to Facebook. "Our scale and position as a leader in data center sustainability enabled us to execute this first of its kind agreement in support of Facebook's sustainability goals," said Digital Realty Chief Executive Officer A. William Stein. "Many of our customers have specific renewable energy requirements, and we work diligently to provide cost-competitive solutions tailored to their needs. We were able to take Facebook's quality standards and timeline into consideration and deliver this solution in a competitive marketplace and at a competitive price. We are very pleased to be part of the solution enabling Facebook to achieve its renewable energy goals."